More Images of Anne Hathaway's Catwoman 'Catsuit' from 'THE DARK KNIGHT RISES'! Earlier today Warner revealed the first image & highly-anticipated look at Anne Hathaway in full costume as 'Catwoman' in Christopher Nolan's Dark Knight Rises. 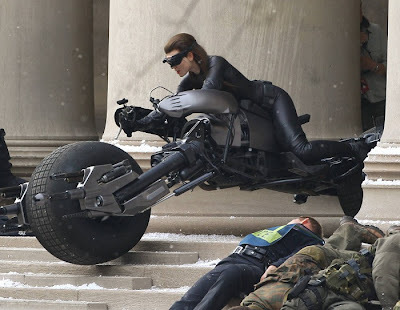 Now we have some more images of the Catwoman Suit as Hathaway's stunt double shoots a scene atop a Batpod. 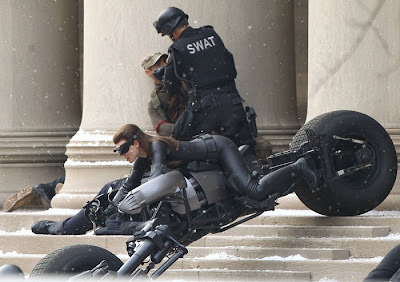 The Dark Knight Rises also stars Christian Bale, Joseph Gordon-Levitt, Tom Hardy, Gary Oldman, Morgan Freeman, Marion Cotillard, Josh Pence, Nestor Carbonell, Michael Caine, Alon Aboutboul, Nestor Carbonell, Matthew Modine, Tom Conti, Joey King & arrives July 20th 2012. Hit the jump for the images. I much prefer these images than the official one released earlier today, we get to see a lot more of the suit which is actually quite sleeker & tighter than it first seemed. The images come via SpoilerTV. Click on them for a larger view. 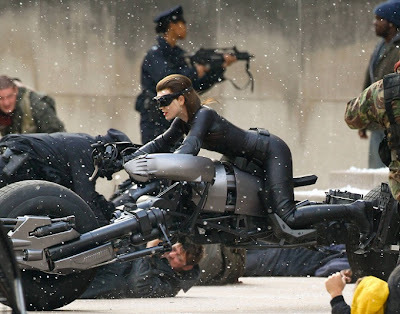 I'm reading: More Images of Anne Hathaway's Catwoman 'Catsuit' from 'THE DARK KNIGHT RISES'!Tweet this!